Update your home's decor without the expensive materials and process! Deciding to change your home’s interior design style in any room can be an expensive choice. This doesn’t mean that you’re limited to your original home design that may feel dated and tired. 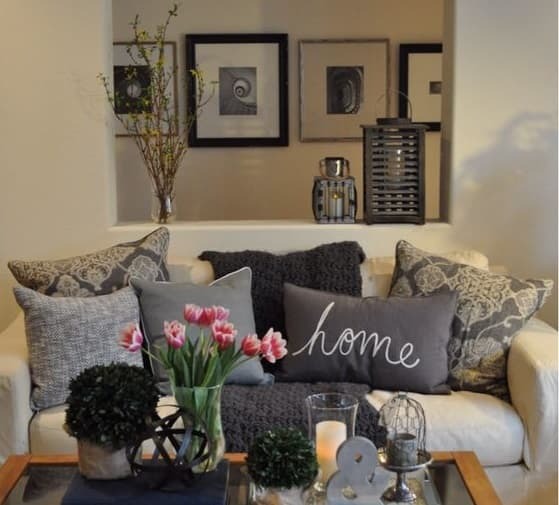 There are plenty of inexpensive home décor options that can help you to recreate your space. Decorating on a budget has become its own category of interior design and is becoming increasingly popular. They key to keeping costs low is to keeping your projects to quick updates. You don’t want a large project that drags out over time. The more time it takes the more money it will cost. These five materials are the perfect options for quick updates around your home. Their DIY-ability and versatility make them an ideal choice for any homeowner looking to update their home’s décor. This seems like an obvious way to update your home, but many people associate painting with a full weekend project. Keep your decorating on a budget by using small amounts of paint around the home. However, there are several small painting projects that you can use to update your home décor. If you’re looking for a simple way to update your lighting, changing a light fixture can be budget friendly and an easy DIY project. Brass light fixtures can tend to date your space, no matter how updated the rest of your décor may be. Spray painting an old light fixture to a more modern matte black. Not only does it make your home décor look more expensive, but it’s an easy weekend project. This small update can change the entire feel of a room. Old furniture can easily be brought into a new home décor style with a fresh coat of paint. Wooden furniture that’s been stripped of their original finish can be painted to fit your new home design. If you decide to create a more rustic or vintage feel in your home, you can distress the new paint job using steel wool and vinegar. This gives you a distressed reclaimed look without the hassle or expense of finding vintage pieces. You can use paint to make more drastic changes to your home décor as well. Painting the walls doesn’t have to be your standard one color project. 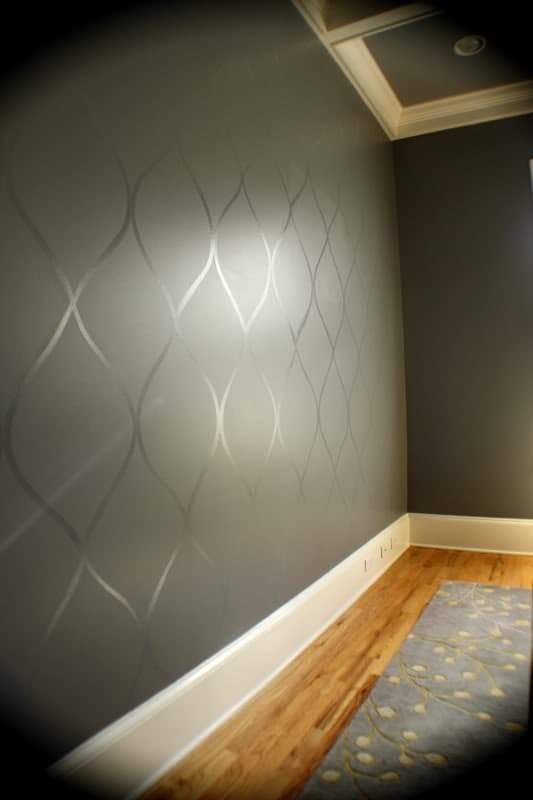 Use a mix of finishes, such as matte and gloss, to create different patterns. By using the same color keeps the wall from looking too busy in your space. Chalkboard paint has been a huge trend in home design. One popular application for chalk paint is to turn a small section of your kitchen wall into a practical grocery list station. New paint colors aren’t limited to your walls. Floors and ceilings have become popular places to add punches of color too. Wooden floors are the perfect place to use a muted color and distress it for a rustic look in your home. Your floor painting isn’t limited to hardwood. Tiles can easily be updated with the right paint and finish. Taking a dated blue or yellow tile to a chic black can change the entire look of your bathroom without changing anything else. The fabric used in your room can define the home décor style. Most homeowners use different fabrics to create the focal points in the room while the rest is kept neutral. Because of this, a simple change of fabric can redefine your space in an afternoon. Different colors and mixtures of patterns create unique spaces in your home. Window treatments are one of the easiest ways to update your home décor. Changing out the curtains from a dark color to a light and airy fabric can instantly make the room feel larger and brighter. If you want to add a touch of luxury to your home design, a valance at the top of your window is a polished edge. You don’t have to spend a lot of money to get this beautiful home feature. Using fabric and a cardboard box to create a valance is an easy DIY project. You can quilt it for an expensive look or keep it a simple flat piece for a modern edge to your windows. If you want to update your upholstered furniture, new fabric can keep your furniture frame and update an old cushion. This is the perfect fix for a thrifted chair that may be sporting its original cushion. A simple update to a bright pattern or a sleek solid color can instantly modernize the piece. If you want an update to your couch without a full reupholster job, throw pillows add a new element to your seating. Throw pillows are easy to make, even for the amateur DIYer. A new pattern introduced to your room can liven up an otherwise simple decor. The beauty of a throw pillow is that it can easily be switched out for a new pattern or color story the next time you want a change. If you can’t find a fabric that fits into your dream design, creating a custom fabric is easier than you think. With the right paints, you can stamp or hand paint a pattern on a solid color fabric. It can be used in cushions, lampshades, and curtains to create a one of a kind home décor that fits into your home’s personality. When many homeowners think of wallpaper, they picture a dated pattern that they’ll never be able to remove from their walls without a lot of work. However, wallpaper has come a long way from your grandmother’s house. Not only are there a lot more design options, but it’s also easier to remove, making it an ideal material for inexpensive home décor. Renter’s wallpaper is a contact paper like material that peels off the wall like tape. It comes in a large variety of designs that can fit into any room. Patterned wallpaper is a great material to use on accent walls and focal points. A busy pattern can overwhelm the space if it’s used on all four walls. However, when you use it on one wall it adds interest rather than clutter. If you want that visual interest, but want to keep your walls plain, consider using the wallpaper on your ceiling. It’s typically a smaller space and can help enclose the room for a luxurious feel. Your wallpaper isn’t limited to standard materials either. One popular repurposed material is to use maps as wallpaper. This is typically used in smaller spaces because maps can be busy. Wallpaper isn’t just for the walls and ceilings. If you find a wallpaper that has a pattern you love, use it as a décor accent! You can use it in small spaces, such as the back of bookcase or inside of drawers. This adds a touch of visual interest without overwhelming the rest of the space. Another popular accent is to create art pieces for your walls. Whether you decide to frame small samples of complimentary patterns or create large art panels of wallpaper, you can use it to put the finishing touch on your room. You can also add wallpaper to risers of your stairs. This is a space that is typically left plain and lacks visual interest. If you think a color pattern may be too busy for your home, you can always add a textured wallpaper instead. These are typically all white baroque style pieces. If you want a different solid color, they’re easily painted. Mirrors are a cheap and easy way to add flair to your home décor. They have one of the widest price ranges starting at dollar stores design and going all the way up to custom designs that cost hundreds of dollars. The wide price range also includes a large variety of designs as well. This makes it an inexpensive home décor essential. If you can’t find the exact mirror you want, you can always find a basic design and enhance it to fit your dream design. Mirror tiles are a versatile material in inexpensive home décor. When used as a backsplash, they can instantly add luxury to any bathroom or kitchen wall. You can also create a full mirrored wall without the cost of an oversized mirror. A gallery wall full of mixed and matched mirror designs can create an interesting focal point in your home design. The different frames complement each other and can be painted to match the rest of your home. A large mirror with a decorative frame is the perfect addition to a simple but lavish living room. You can paint or distress the frame to fit your design needs. If you want touches of reflection without a huge piece, table top accents are perfect. One popular DIY project is to take an old framed mirror and add felt backing to the frame and use the piece as a tray. Other people use mirror spray paint to take inexpensive glass vases and make unique reflective pieces. This is also a great upgrade for cheap votives and jars. Mirrors serve a practical purpose in most rooms. 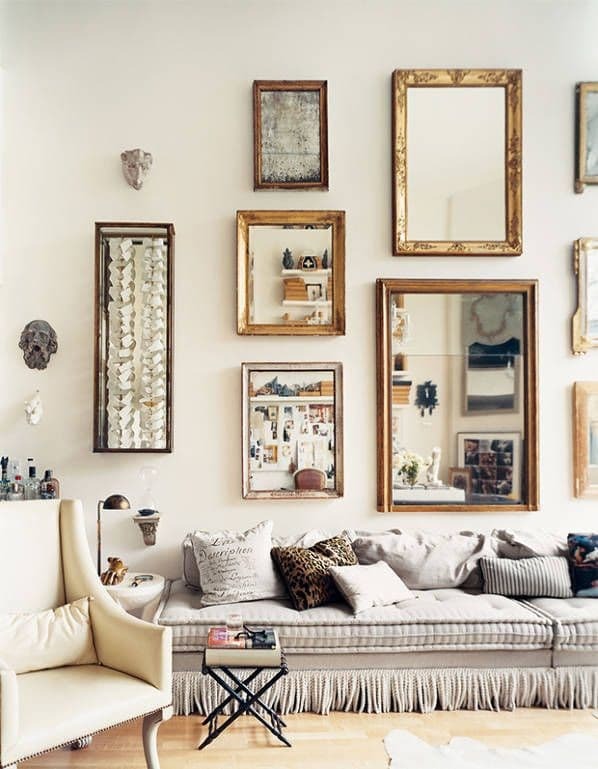 Whether you decide to use a large oversized mirror or fill a gallery wall with different designs, mirrors have several benefits in the grand scheme of the room. Mirrors extend the end of the room and help it to feel larger. This is a great trick to keep a small room from feeling cluttered and cramped. Mirrors also help a room to feel brighter. By reflecting light back into the center of the room, it completely fills the room. If you want to add a Victorian flourish to your home design but you’re decorating on a budget, the addition of molding can go a long way. While most people add molding at the meeting place of the wall and ceiling, it has many other uses. Overall, it adds a finishing touch to an otherwise raw edge. This give your room polis that it may not have had before. When adding molding to your walls, you’re not limited to the standard tops and bottoms of the wall. You can create architectural features in your home that weren’t a part of the original build with the simple addition of molding at different heights. 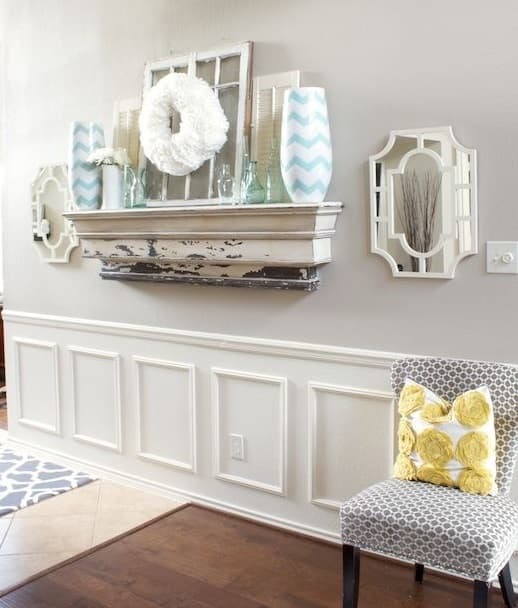 Add a small lip above your standard molding on the base of your walls. By painting this now empty space, the molding, and the lip the same color, you can create a faux baseboard around the foot of your room. If you want to add interest to your walls at a higher level, you can use the same lip but mid-way up the wall to create a faux chair rail. You can also create wall panels within the wall itself but installing the molding in a way that creates a square or rectangle. By keeping the molding a contrasting color, you’re adding a built in interest that looks like it was a part of the original home design. Crown molding is limited to just walls. You can combine the molding with a shelving unit to create a faux built-in look. These pieces are usually very expensive and won’t fit into a small home décor budget. However, if you use crown molding to enhance a standard bookshelf, you can create a traditional home design at a fraction of the price. If you have dated cabinets in your kitchen, you can give them a quick update with oversized crown molding. The large piece will close off any space that is open between the top of your cabinet and the ceiling and give your kitchen a more custom look. You can create a gorgeous and luxurious home design without going way out of budget. Not only are these simple projects, but they're made with materials that are easily found at any home improvement store. Each of these five materials can be used in alone or in combination with one another to create beautiful home projects. Take an afternoon and add some new home design features to your home!